Review: I've had this book on my shelf nearly since it came out, but picked it up this month because it's Utah author month! Hurrah! The beginning of this book (and sometimes throughout) reminded me a lot of The Goose Girl. The "animal magic" is very similar to Ani's "animal speech." 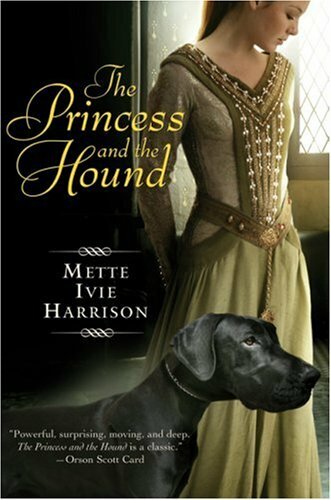 The Princess and the Hound was similar enough to The Goose Girl that I warmed to it instantly, but not so similar that I wanted to compare them. The writing in this book is beautiful. Full of wonderful ideas, prose, and descriptions. The problem I had with it is that I kept feeling like I was missing things. I don't know if I just wasn't reading into the text deep enough, or maybe some things were worded in such a way that I got something different from it, but I just felt... confused. The prince jumped to a lot of conclusions, and I wasn't sure how he'd gotten there. For instance, I TOTALLY missed when he fell in love. One moment he's acting all awkward, and then he proclaims "I love you!" I had to do a double take. I flipped back a few pages, wondering when and how he'd had this sudden realization. I still haven't figured it out. I found that what I needed to do was just let my mind relax. If I let myself get hung up on all the little details it would drive me crazy. But if I just let the story flow, it all seemed to make sense. Kinda like original fairy-tales. Those stories usually have so many plot-gaps and holes that if you try to analyze it, it doesn't make any sense. But if you take a step back you can see the meaning. This story follows the tradition of fairy tales in that way. Which is good, 'cause I love fairy tales. Have I made that clear yet? So even though there was definitely some confusing moments in this book, I still really enjoyed it and the lore behind it. That, and the beautiful writing, make this book definitely worth reading. I've heard that the next two books get better and better. I'll be sure to let you know. EDIT: I'm reading The Princess and the Bear right now and I already LOVE it. Honestly. So good. I hope it stays this good. I always wondered how this book was, so glad to hear it's good! I'll have to pick it up now. Thanks for the review! I just finished reading this and I loved its fairy-tale-ness. Can't wait to read the next two! I need to reread these this summer. It's been a while since I read this one, but I agree with a lot of what you've said in your review. I'd be interested to see how I feel about the first now that I've read the second and third. The second is my favorite though! And yes, Mette is a seriously beautiful writer!